You are here: Home / InfoSociety / How ‘small’ is Europe in Big Data? Neelie Kroes, Vice-President of the EC in charge of Digital Agenda, went to Vilnius where she participated in the “ICT 2013 – Create, Connect, Grow” event, a session dedicated on “Innovating by exploiting big and open data and digital content” which took place at the Lithuanian Exhibition and Convention Centre (LitExpo). One of the major current debates in ICT is the one of open big data. 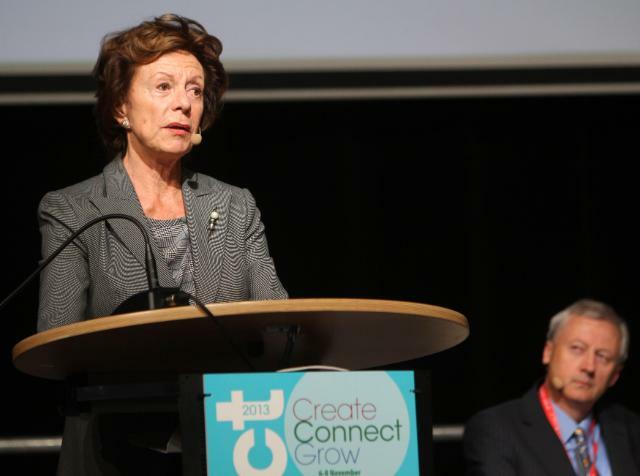 Last December, Neelie Kroes, the Vice-President of the European Commission for the Digital Agenda, made a speech in the European Data Protection Congress in Brussels for the importance of data in the modern world and the numerous opportunities that arise from them. While the world is facing tremendous changes as a result of the huge and continuous improvement in technology, the EU needs to seize this opportunity and become the world leader. It’s often said that we live in the Era of Big Data. We are at the beginning of a paradigm shift. Huge amounts of data are starting to be generated automatically. Improvements in technology enable us to store, manage, process, manipulate and analyse these huge amounts of data like never before. This can change the decision making process and the way business runs. Big data is a sector with 40% annual growth and Europe is way far to be seen as a world leader. Europe’s lack of leadership in big data sector is more than obvious with only 2 out of 20 leading companies being European. This has implications not only for the European big data industry, but also for every business and every sector that could get the big data boost. Europe faces many barriers in the big data sector. Many are involved in this field – researchers and manufacturers, suppliers and demanders – and ultimately there is not a coherent data ecosystem. It is fragmented between sectors, languages and national borders. In each EU country, different laws and policy practices affect what can be done with data, and shatter the digital single market. EU action should provide the right framework conditions for a single market of big data. EU must ensure that relevant legislation supports entrepreneurship in this area. One example is the recent European legislation to open up government information and turn it into a source for innovation. This Open Data Strategy will enable public sector to offer services that are more efficient, transparent and personalized. The EU Commission also recognizes that research data is as important as publications. Thus, it launched the Pilot on Open Research Data in Horizon 2020 in December, which provides scientists with new ways to share, compare, and discover new fields of research. The main purpose of the Open Data Strategy and the Open Research Data is to improve and maximize the access and re-use of research data generated by projects in order to benefit the society and the economy. How open is Horizon 2020? While the improvement in the technology is the major indicator for the rise of big data as an essential field for business and research, it can also be seen as an obstacle. Privacy concerns are a very important issue that creates scepticism among people. Nobody knows how their private data can be used and analysed by big companies. It is essential to create a legislation that can address these concerns and protect the privacy of the European citizen. Notwithstanding, this cannot be seen as an excuse not to develop the big data in Europe. It is an opportunity for Europe to create a very competitive and differentiate business and research environment, in order to attract the biggest corporations and the most respectful institutions and researchers.